Wow, these design concepts are becoming crazy-cool than ever. Its a shame they can’t be transformed into reality anytime soon. 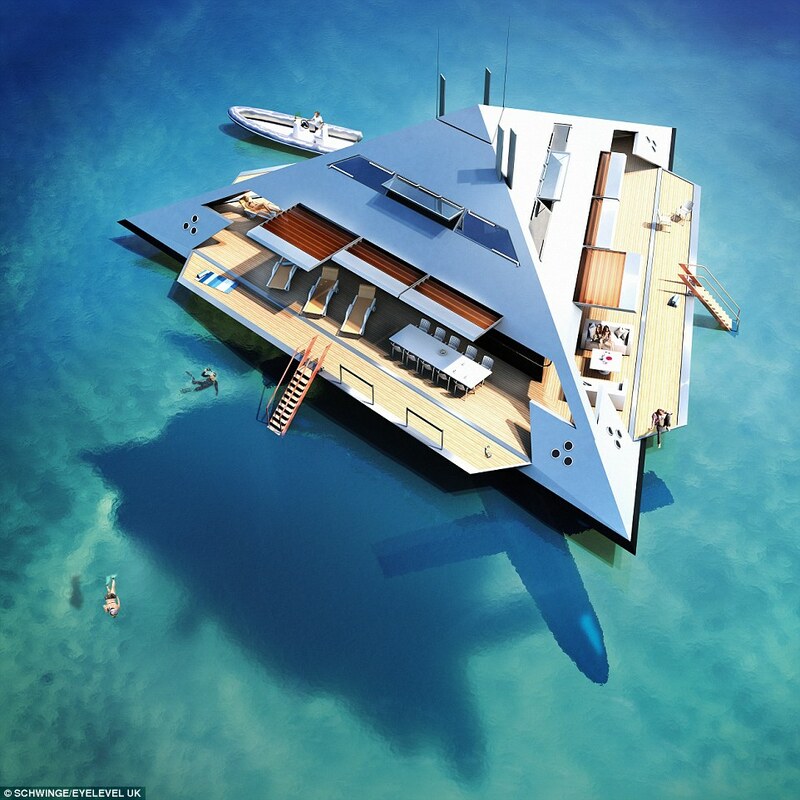 This new idea of a Tetrahedron Superyacht from London-based architectural firm EYELEVEL UK does manage to flip the traditional design formalities quite literally out of the water with its innovative approach. It appears to be levitating on top of the ocean surface instead of floating like a normal water-based vessel, but it is actually not. It is connected to a set of submerged hulls via a vertical strut that goes several meters below the surface. Aside from the fantastic design, the new super yacht has all the ultra-luxuries needed to justify its multi-million dollar eventual price tag. Despite the awkward positioning of the hulls, the ship can cruise at a top speed of 38 knots and it can take-off from the water surface at 15 knots. 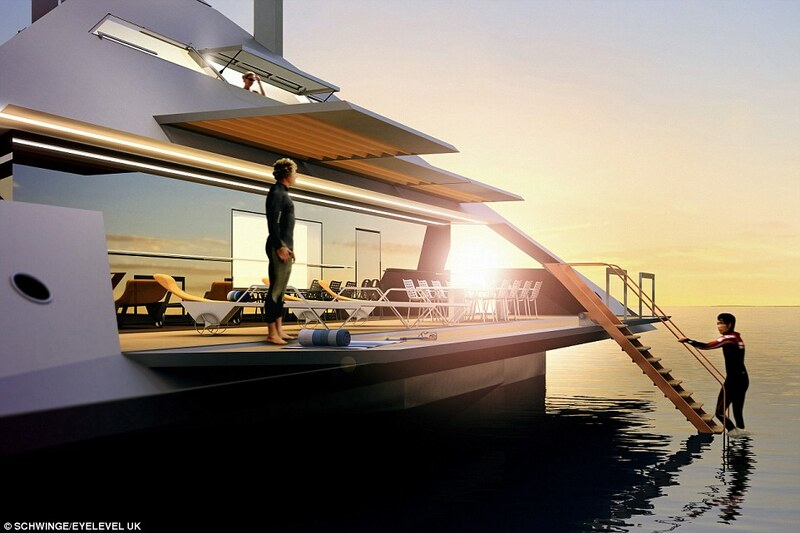 With a range of 3,000 nautical miles, it has a unique design that allows it to travel in rough conditions when waves would be crashing around contemporary yachts and damaging their hull. With a trio of submerged hulls and levitated body, much of the dangers from waves could be averted. 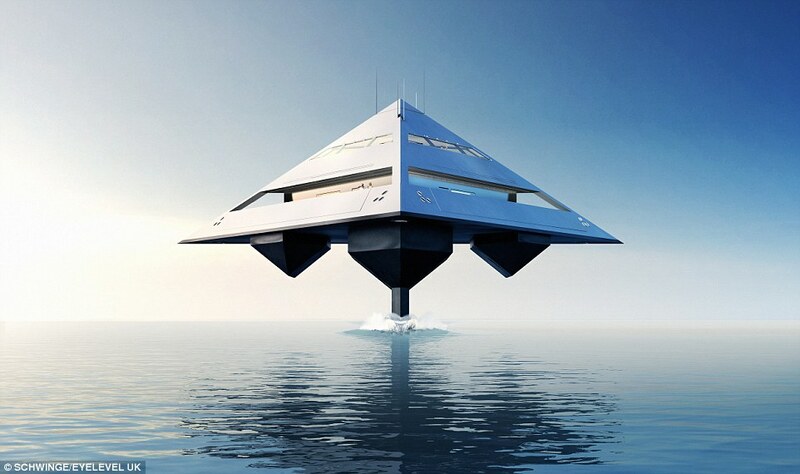 At low speeds, the Tetrahedron Super Yacht sits comfortably on the surface of the water, but when speed approaches 15 knots, the vast pyramidal structure rises from the water. Any chance it will come in ocean liners so that people like us could afford to have a ride on it? We’re not sure. ‘A three-based pyramid consisting of four faces and six leading edges provides fundamental stability and enclosure.’ according to Jonathan Schwinge, the chief designer of this project. The price of an eventual project was not yet revealed by the company, but it must be a lot more than an average luxury yacht. The ocean going yachts’ restrictions on hull design are also a challenge for the company. All in all, a nice out-of-the-box idea from the designer. Anyone who has seen the Battleship movie would learn to appreciate it.